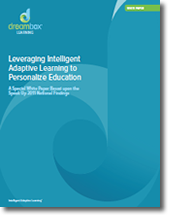 Why is this the right time for greater interest in intelligent adaptive learning? What is the value proposition for adaptive learning? Are teachers ready for this? What do they need to be able to leverage these new tools effectively in the classroom? 28% of administrators are calling for an “individualized education plan” for every student, not just special needs students. Two-thirds of principals (67 percent) noted that the use of digital content in the classroom increases student engagement in school and learning, and 45 percent see digital content as a new pathway for personalized instruction for each student. In 2007, only one in ten teachers was using some type of digital games within instruction; in 2011, a quarter of teachers (24 percent) identified online and software games as part of their instructional toolkit. Parents want technology solutions that provide individualized instruction — 57 percent of parents see online learning as a way for their child to work at his/her own pace. District administrators rank intelligent adaptive learning #1 for improving student achievement. 59% of principals would like incoming teachers to arrive with experience in adaptive learning tools. According to 43 percent of school site administrators the critical obstacle to realizing the benefits of digital content to personalize instruction is “teachers are not trained”. Click here to download the report from the Dreambox website. It is quick and easy to activate your district (or school). Sign up for Project Tomorrow News to receive updates about Speak Up!